The superbly scenic highway, Utah-95, also known as the Bicentennial Highway, connects Blanding, Utah with Hanksville, Utah. 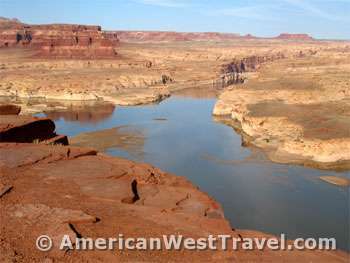 For miles both north and south of its crossing Lake Powell you will enjoy spectacular canyon country scenery. The route crosses the far eastern (upstream) end of Lake Powell, about a mile east of Hite Marina. Note its bridge in the photo at right. North of the crossing, the road climbs sharply for several miles before reaching Hite Overlook, an outstanding roadside stop. Lake Powell is extremely low here so the vistas provide a good idea of what Glen Canyon might have looked like before it was largely drowned by the Glen Canyon Dam which was completed in 1963. 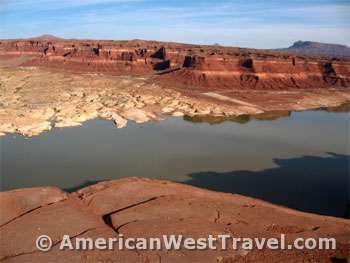 Many old-timers considered Glen Canyon more surreal and spectacular than the Grand Canyon but few knew about it due to its extreme remoteness. (Back then the area was largely a roadless wilderness.) It is "The Place No One Knew", the title of late master photographer Eliot Porter's eulogy of a unique natural wonder now long since extinguished by a power dam. The famous author and environmentalist, the late Ed Abbey, perhaps the godfather of canyon country, hated the dam with a passion because Glen Canyon was his special place and he loved it with a passion. His book, The Monkey Wrench Gang, was his fantasy about monkeywrenchers blowing up the dam. The photo above left looking east clearly shows the walls of Narrow Canyon beyond the Utah-95 Hite Crossing bridge. The lake arm at left is where the Dirty Devil River once joined the Colorado River. The mouth of the Dirty Devil, 169.5 miles from Lee's Ferry, is the upper limit of Glen Canyon. Above Glen Canyon is Narrow Canyon, and then Cataract Canyon which heads at the confluence of the Colorado and Green rivers. The photo, right, looks straight down at Hite Marina, the most remote and least developed of the Lake Powell marinas. It no longer gets much use. The lake has been extremely low for many years due to a long-term drought (some believe this is the more normal condition for this region). Note how the concrete boat ramp no longer reaches the water. Remains of a "boom town" lie in the lake below you. The small town - once a miners' haven - bears the name of early settler, Cass Hite, who first found gold here in 1883. Following World War II the population of Hite City increased to 200 people. Instead of searching for gold, residents swept the area for uranium. Locals said the miners had "uranium on the cranium" as prospectors searched for "hot" rocks or ore.
Like all mining booms in the West, this one, too, dwindled, returning Hite to its small-town existence. Finally, in 1964, the rising waters of Lake Powell engulfed Hite, ending forever what dreams of prosperity had begun. Caption of a photo of Chaffin Ferry: The crossing at Hite became popular in the mid-1900s. In 1948, a permanent ferry was established to haul vehicles across the Colorado River - the cost: $5 per car. It wasn't until 1946 that a dirt road was completed between Hanksville and Blanding, Utah. Ferry service began at Hite City in September, 1946. The ferry was the only crossing along a 200 mile stretch of the river. Before that time, one had to cross the river either by swimming or by finding a boat. The ferry ceased operations in June, 1964 as bridges were built and Lake Powell filled the canyon. At maximum level, Lake Powell at the ferry site is 255 feet deep. After surviving the rapids in Cataract Canyon, Powell's expedition camped below at the mouth of the Dirty Devil River. In 1869, when Powell launched the first voyage down the Colorado, the river's exact course was a mystery. There were rumors of waterfalls and whirlpools that could swallow boats whole. To see what a pre-1962 Glen Canyon looked like, check out Phil and Keturah Pennington's web site on Glen Canyon Before the Flooding. The Hite Overlook is located about 10 miles north from the Hite Marina on highway Utah-95.